David LaChapelle, Luis Sanchez and Fulvio Di Piazza round up an extraordinary group of international artists launching at the Royal West of England Academy (RWA) this week. Unnatural - Natural History shows a view of the world where humans do not dominate, where natural becomes unnatural. This is nature through the eye of science fiction, natural beings warped by environmental pressure. 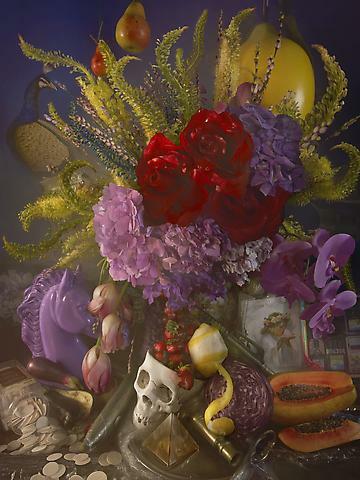 World famous David LaChapelle is known internationally for his exceptional talent in combining a unique hyper-realistic aesthetic with profound social messages. LaChapelle “Concerning the Soul” , a chromogenic print, one of edition of five will be part of the show. Mexico born, Los Angeles-based painter Luis Sanchez is a beguiling and animated artist, who’s paintings are grim and sublime, realistic and idealistic. His two-dimensional works are often noted for his masterful use of trompe l’oeil, leaving viewers with the impression that he has used photography, collage or other techniques when he has only used a brush. His works seamlessly combine the old and new, and have an uncanny way of mixing architecture with the human form. Highly imaginative Fulvio Di Piazza creates whimsical paintings of anthropomorphized landscapes with an extraordinary level of detail and depth. Previous works have depicted lush woodland fantasies, revealing saturated forests filled with faces as distinct features emerge from hills, rocks and tree trunks, sprouting limbs in place of roots and branches. David LaChapelle, Luis Sanchez, Angela Singer, Geza Szollosi, Kate MccGwire, Nick Bright, Meryl Donahue, Natalie Shau, Patrick Haines, Karen Akester, Beth Carter, Jessica Joslin, Troy Abbott, Chantal Powell, Dean Melbourne, Susie MacMurray, Christopher Russell, Angela Lizon, Rose Sanderson, Pitch Tangpun, Nicole Etienne, Erik Sandberg, Marco Mazzoni, Deedee Cheriel, Heiko Muller, Corine Perier, Luis Sanchez, Christian rex Van Minnen, Scott G Brooks, Fulivio de Piazza, Laura Ball, Lyndsey Carr, Rupert Bathhurst, Ryan McLennan, ROA, CASE, Pure Evil. Unnatural - Natural History is curated by Coates and Scarry. Unnatural – Natural History is at the RWA, Bristol from 13 July to 23 September. Entry is £5 full, £3 concession and free for under-16s. Visit rwa.org.uk or call 0117 973 5129.